About a month and a half ago, I found myself feeling quite nauseous. I knew it was not morning sickness, but it sure felt like it. Well, it turned out that my glasses were starting to become crooked because a piece on the hinge was starting to give way. I was relieved to finally determine the cause of my nausea, but a little bummed that I needed to take the time to look for new glasses. The immediate solution that came to mind for my problem was to order glasses online. This would allow me to avoid having to figure out who has the best prices, trying to make an appointment that would fit into my hectic schedule, and dragging 2 or 3 children with me to try on glasses. I had tried prescription glasses from GlassesUSA.com before, so I was very happy when they provided a gift code for me to shop. I ended up choosing The Chief for my frame style. I had owned black-rimmed glasses before and liked the look very much. Plus, based on the measurements of the frame, the bridge, and the temple, I knew these glasses would be a good fit for my head shape and size. Because I am pretty experienced at buying eyeglasses online, I did not even need to use the Virtual Mirror, where you can upload a photo to try on the glasses virtually. Make sure you ask your optometrist to measure your pupil distance for you and to write it on your prescription. Measure your existing glasses to find out the height and width of the frames, the length of the bridge, and the length along the temple. Then you will be able to compare the measurements to the ones listed on the site for the frames you like. Find a place like GlassesUSA that offers a 100% satisfaction guarantee. So, what do you think? . 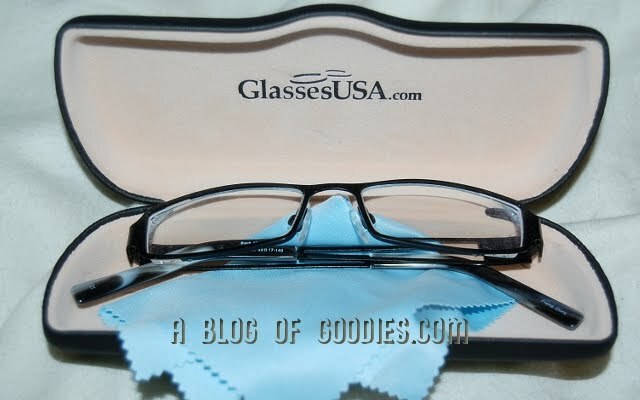 . .
My single vision glasses with the Super Thin lenses plus 3 coatings cost $120.80 after I found a promo code for 20% off plus free shipping on any order of $80 or more on the GlassesUSA Sales & Coupons page. Here are two more coupon codes for ABOG readers . . . Take $25 off glasses with Transitions lenses with Code: Trans25 or save 10% off any order with Code: Blog10. You can also learn about exclusive discounts by "liking" GlassesUSA on Facebook and following GlassesUSA on Twitter. This article was based on my own personal experience with this product, which was purchased partly with our own funds. Although I received a gift code from the company, no compensation was received for sharing my experience with our readers. All thoughts expressed in this article are my own.